We started the weekend with these cute little cards @lisswade made - GRL PWR! They each have the quote "When women support each other, incredible things happen." I LOVE it because it's absolutely true. Along with the cards, we gave each of the girls Made By Mary necklaces that said "GRL PWR" on them - they turned out absolutely perfect and will be the best reminder of our weekend and our friendship! I'm grateful for these women in my life - women and friends who I have loved from day one. My sister and I started an annual girls humanitarian weekend a few years ago with our friends and it is one of my favorite traditions of all time. I love that we set aside time every year to get together to celebrate and strengthen our friendship, while getting to grow and serve at the same time. Each year, we meet with a purpose to do good for others. One year we made feminine hygiene kits for women in Africa, another year we made blankets for patients with cancer, and last year we put together kits for refugee families in Utah. This year, we put together care packages for the homeless men and women of Chicago. We are so grateful for the awesome companies that helped make our little kits more full. 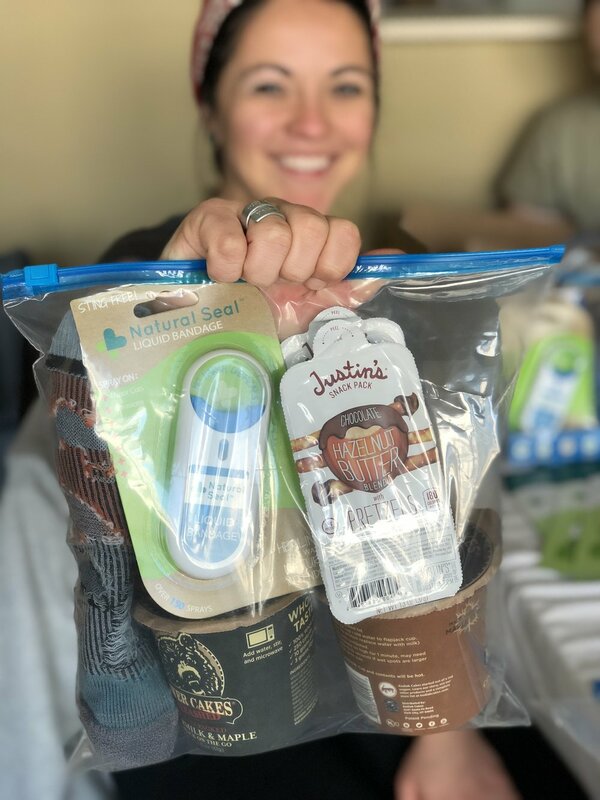 So thank you thank you to Justin's Peanut Butter, Kodiak Cakes, Savannah Bee Company, Keri Cure, and Farm to Feet for your contributions - it made our weekend that much more sweet. I thought it would be fun to share a few of our experiences handing out the kits that touched my heart. Our first experience was with Lisa, a homeless woman on the streets of Chicago. I think she was shocked to have a group of women stop and chat with her and who genuinely wanted to hear her story. I love how my friend Mattie shared her thoughts about our experience. "We chatted with her a bit and then right before we were about to go, Madison softly touched her arm and said, “We want you to know that we see you”. I was deeply moved by how much this phrase meant to Lisa. Being passed every day by hundreds of people, while clearly sitting in a very difficult spot of life, I’m sure she feels forgotten and unnoticed. Although I wish there was more we could’ve done to help, I know that by noticing her and hearing her that day, we did make a difference. I want to be more of this person, someone who really sees people." I love how wise my friends are and their efforts to SEE people. Another experience I loved was with Charly. He couldn't wait to open his care package to see all the goodies. He pulled out the jar of honey, opened it and took a big taste of it. And went for more right away. It was really sweet to see how much he appreciated it and how excited he was. I loved meeting Kate and seeing her share her Justin's Peanut Butter goodies with her friend and checking out the kit together. It made my heart happy to see the big toothless grins of several homeless men who received kits. I loved seeing the eyes of an old man light up after he realized we cared. And while I loved seeing the responses of those we gave kits to, I loved seeing Madison be so touched after hugging Lisa, I loved seeing Mattie validate their struggles and that people want to help, I loved hearing Julissa talk about the misconceptions of homelessness and how they are just people like us, I loved being able to see how genuine Madi was to the people we met, I loved helping Addison put chapstick in each of the kits while thinking about the strong and supportive women she will have as examples in her life and I loved watching my excited husband run across the street to give his favorite homeless man a goodie bag. Service works both ways - and I think we were all touched just as much as those we set out to serve. I know I was. It also helped that we held our girls weekend in Chicago (the BEST city in the world) for our girls weekend this year! Here are a few highlights and pictures from our weekend! Before the girls got here, I made a stop at Alliance Patisserie to stock up on the goodies! Giordanos - THE best place to get deep dish pizza in Chicago and everyone knows it! We wanted a fancy girls night out and decided the Hancock Tower was the place to do it! We went up to the Signature Lounge on the 96th floor and had strawberry smoothies while overlooking this majestic city! Such a fun night!! We stopped at this cute restaurant (Siena Tavern) for brunch before hitting the bikes. It was so yummy! We rented bikes and cruised along Lake Michigan on our way to Lincoln Park. So fun and so cold. The Bean. When in Chicago. We felt so spoiled at the Peninsula Hotel dining at Chocolate at the Pen. We were there almost 3 hours just chatting the night away and treating ourselves to the yummiest treats, while listening to the most beautiful live music. It was such a fun and unique experience for us and the perfect girl's night out. It was a weekend filled with lots of girl talk, laughs, good food, service, and friendship and I'm already stoked for next year's girl's weekend!